Having company for dinner is a good excuse for me to try new recipes. Caleb has never understood why I would want to try out a new recipe on dinner guests, but I think that's half the fun. I try to stick to just one or two new recipes per meal, since I'd like to think at least half the meal will turn out as expected. We had company for dinner this past weekend, and I made this chocolate cake for dessert. 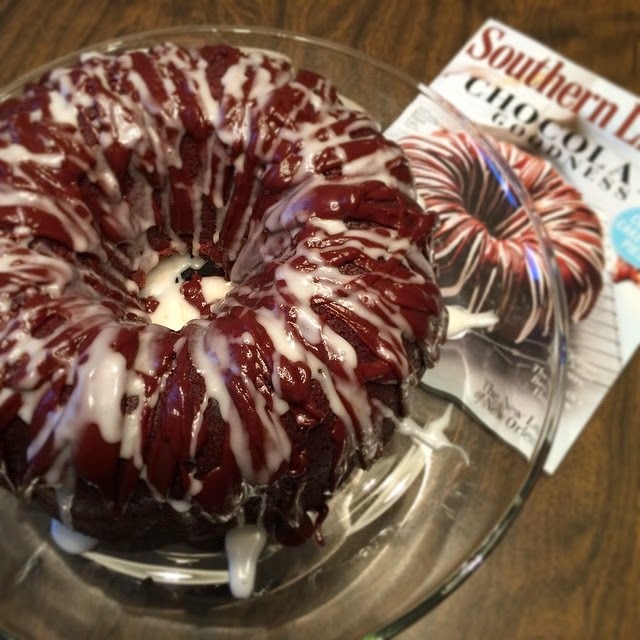 It was the cover recipe on this month's Southern Living, and as soon as I got my copy in the mail I knew I had to try it. For as many ingredients as it calls for, it was a relatively simple cake to make. I let the cake cool for most of the afternoon, and whipped up the glazes right before our company arrived. For chocolate lovers like myself, this cake is definitely a winner. Heat oven to 325 degrees. Whisk together flour, cocoa, baking powder, and salt. Beat 1 1/2 cups butter in a medium bowl at medium-high speed with an electric mixer until smooth. Gradually add sugar, beating until light and fluffy. Add eggs, 1 at a time, beating just until yolk disappears. Combine 1 1/4 cups buttermilk, instant espresso, and vanilla extract. Add flour mixture to egg mixture alternately with buttermilk mixture, beginning and ending with flour mixture. Beat at low speed after each addition. Fold in bittersweet chocolate morsels. Pour batter into a well-greased and floured 12-cup Bundt pan. Sharply tap pan on counter to remove air bubbles. Bake at 325 for 1 hour and 15 minutes to 1 hour and 25 minutes, or until a wooden pick inserted in center comes out clean. Cool in pan on a wire rack 20 minutes. Remove from pan; cool completely on rack. Prepare chocolate glaze: combine semisweet chocolate morsels, butter, and corn syrup in a microwave-safe glass bowl. Microwave at medium (50% power) 1 to 1 1/2 minutes or until morsels begin to melt, stirring after 1 minute. Stir until smooth. Stir in vanilla. Prepare buttermilk glaze: whisk together powdered sugar, buttermilk, and vanilla in a small bowl until smooth. Drizzle glazes over cooled cake. Serves 10-12. I love pound cakes and chocolate! What a great combo! Can't wait to try this too.